The U-Scan Genesis™ is simple, fast, and efficient while providing maximum flexibility, space-savings, and reliability. The unique design of the U-Scan Genesis makes it highly adaptable to your store’s own requirements— today and tomorrow. The U-Scan Genesis provides exactly the same functionality as your existing POS software application. This means there’s no duplicate training for your cashiers; what they see at the POS is identical to what’s visible in Direct Mode at the U-Scan Genesis. Shoppers appreciate the time-saving benefits that self-checkout offers, and retailers typically see a return on investment in 12 months or less. U-Scan Single-Bag Unit- For small retail stores, convenience stores and discount retailers in both standard & express lane configurations. U-Scan Dual-Bag- Designed to work in any retail environment where both bagging and overall space are critical. 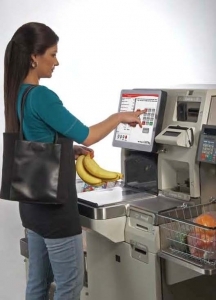 U-Scan Genesis 4-Bag- Designed for higher volume supermarkets and mass merchandise retailers. U-Scan Carousel – Rotating bagging platform accommodates large order sizes with variable configurations of either 6 bag racks or 4 bag racks and recycle bin space, in addition to a secondary scale for larger items. U-Scan Genesis Kiosk – Super-compact model with no bag scale. It is ideal for departments within larger stores or anywhere unassisted sales are needed. U-Scan Genesis Payment Station – Full-service tendering (coin and bill accepting and dispensing) model increases throughput during significant customer surges or where register space is limited.